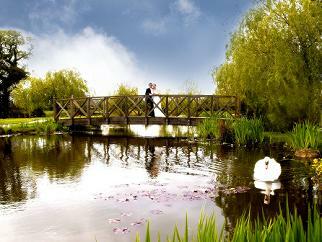 At the Grosvenor Pulford Hotel & Spa we are here to make your Wedding Day dreams come true. Weddings are our speciality, whether it is a small intimate gathering or a large celebration. We will take care of every little detail from the ceremony through to your evening reception. Our dedicated and professional team will ensure that everything runs smoothly so that you can relax and enjoy the magical day. We are licensed both indoors and outdoors for civil ceremonies and civil partnerships and have a selection of beautifully appointed wedding suites which will give you the ideal setting, tailored to your individual requirements. We have many wonderful settings for your wedding pictures including stunning countryside backdrops, our beautiful lake and quaint thatched gazebo. This 4 star hotel also boasts 73 en-suite bedrooms, a Mediterranean themed restaurant, a stylish gastro bar, and a luxurious spa featuring 6 indulgent treatment suites, 3 relaxation rooms, a VIP couples suite, Hamman, Arabian Rasul, Rejuvenation Skin Clinic, swimming pool, sauna, steam room, Jacuzzi, gymnasium, tennis court, Spa Boutique and Spa Eatery. The Grosvenor Pulford Hotel & Spa is set in its own grounds and ideally located a 5 minute drive from Chester City centre, yet a stone’s throw from the beauty of Wales. You can ensure that our experience and personal attention will make your wedding day the perfect day to remember.